During a facial, an esthetician applies products picked out especially for your skin. 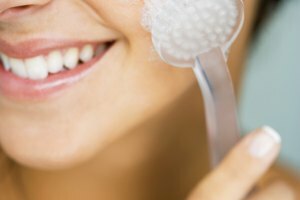 Facials and microdermabrasion are two skincare techniques that aim to make your skin look its best. A facial includes aspects from an entire skincare regimen, such as cleansing, exfoliating and a hydrating mask, while microdermabrasion is a nonsurgical cosmetic procedure that focuses on deep exfoliation. The best skincare option for you depends on the condition of your skin and what outcome you want. The goal of a facial is to remove impurities from your skin and to give your skin what it needs, which may be moisture or extra vitamins. During a facial, a licensed esthetician cleanses your skin and analyzes it under a light and magnifying lamp to determine the next steps. After the analysis, the esthetician applies products specialized for your skin. She may exfoliate to remove dead skin cells; do some extractions to remove blackheads and other blemishes; and apply a mask to cleanse and moisturize your skin. Some facials involve a face and neck massage. A procedure called microdermabrasion may lighten up dark spots and scars left behind from acne breakouts. During microdermabrasion, a trained skincare technician or dermatologist sweeps a tube across the surface of your face. The tube releases crystals that penetrate the layer of skin called the epidermis and slough off dead skin cells. The procedure is costly, and it generally takes a series of five to 12 treatments -- plus regular maintenance -- to see results. If you're concerned about acne scars, you may benefit from an enzyme treatment, which helps brighten and even out skin tone. An enzyme treatment can usually be performed during a facial. Boyers, Lindsay. "A Facial vs. Microdermabrasion." Synonym, https://classroom.synonym.com/facial-vs-microdermabrasion-14549.html. Accessed 23 April 2019.